Have you ever imagined infiltrating a room that conceals your birthday surprise? Would you like to spy on your loved ones and capture hilarious photos from new and exciting angles? If so, the iSpy CV Copter is your new best friend. Not only can you partake in reinventing flying adventures, but this aircraft also comes with a 0.3 MP undercarriage adjustable camera—capable of taking videos and photos while in flight! Equipped with a special searchlight, you’ll always enjoy exciting expeditions. 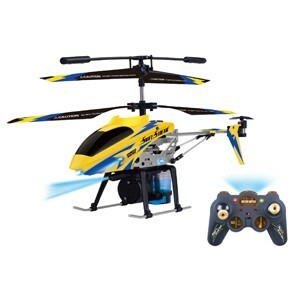 If style, fun, and efficiency is on your list of priorities, then the iSpy CV Copter is sure to please. Fly up to 3 helicopters at the same time! Records up to 7 minutes of color video and takes over 200 photos. Have you ever wondered what it would be like to take to the skies with a missile launching machine? Well, wonder no longer! 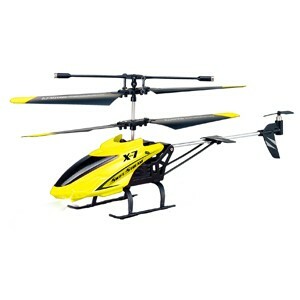 This HOBBY GRADE helicopter will let allow you to do just that. With a flight distance of up to 40”, LED searchlight, built-in auto pilot for real adventure test flights, and up to 7 minutes of flight time you’ll enjoy a sky expedition like none other. In addition, our quick charge time ensures that you’re never on the ground for long. 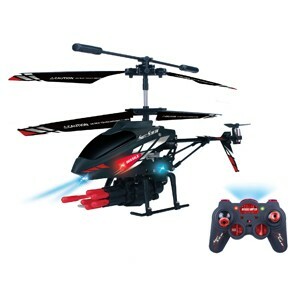 If you’re ready to shoot some missiles, this helicopter’s ready for you! Rapid fire missiles at the touch of a button! Fly up to 3 helicopters at one time! With the S-211 Recovery it’s all about pilot guided specifics coupled with a truly enjoyable flight. 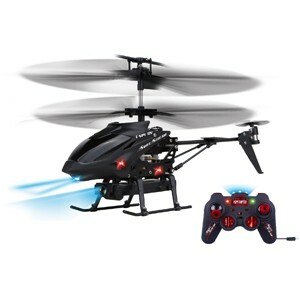 With flight distances up to 40 feet, a stellar built-in auto pilot feature for exciting real adventure test flights, 8 minute flight times, and a remarkable infrared remote control system, it’s easy to see why the Recovery is a lifesaver. 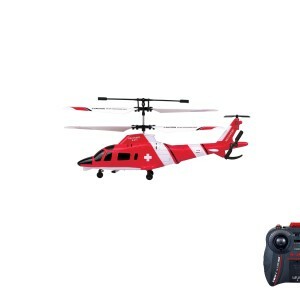 You can even charge your helicopter right from the remote control! Once it’s in your hands, you’ll understand why the Recovery is deemed one of the best in its class. 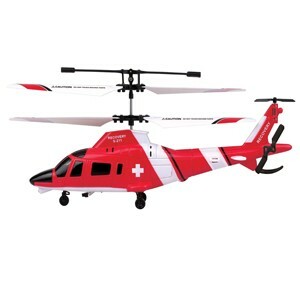 This HOBBY GRADE helicopter is just right for those scorching hot summer days indoors! 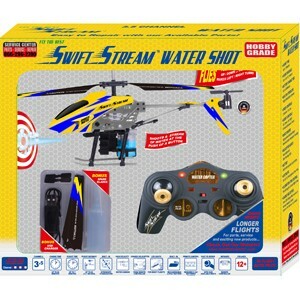 With a flight distance of up to 40” and the ability to fly 3 at a time (without frequency interference), you and your friends can enjoy the ultimate water fight. The built-in water cannon shoots a powerful stream of water with just the push of a button! But that’s not all, this aircraft also comes with a searchlight, an amazing auto pilot feature for real adventure test flights, and up to 7 minutes of flight time. If you’re looking for a wet and wild voyage in the sky, the Swift Stream Water Shot is just right for you! When it comes to the X-7 helicopter, it is truly first class! This premium aircraft doesn’t disappoint when it comes to style and action. 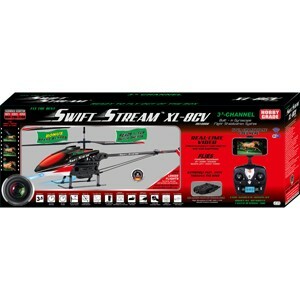 Designed with a full metal, aerodynamic body, this model features an 8 minute flight time, flight distances of up to 40 feet and an impressive built-in autopilot for captivating stunt maneuvers. You can even charge your X-7 right from the infrared remote control! With stats like that, the X-7 is sure to please. Measuring almost 3 feet long with powerful engines and a full metal body that cuts through the wind, you’re sure to have the ultimate “all in one” experience with the HOBBY GRADE XL-8CV. Equipped with a Wi-Fi camera, you’ll be able to take stunning pictures and unique videos while in flight. With a flight distance of 100’ meters, just think of all the ground you could cover. 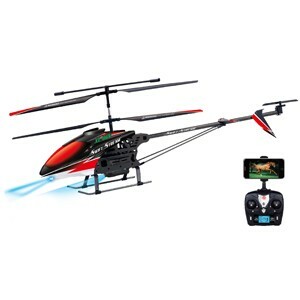 Lightening-speed mobility, hovering capabilities, and high quality streaming (directly to your smart phone) are just a few of the features that make this helicopter a true “must have”. Android and iPhone® via free app (through iTunes or Google Play) or via QC code. Fly up to 4 units at one time!